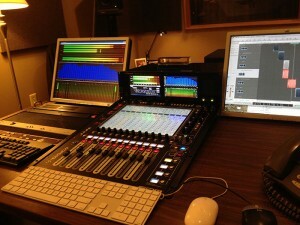 Engineer Vinnie Alibrandi has found a new use for his DiGiCo SD11 console in the post-production world. The 19-inch rackmountable mixer, which has typically ended up on small tour riders and install gigs where small but powerful were the major requirements, proved to be the perfect solution for Alibrandi to handle mastering duties in the studio. Alibrandi, who is a Post Production Engineer at the newly created Capitol Christian Music Group, also runs sound at Nashville's HopePark Church on the weekends. Three of the artists he recently mastered for Radio, iTunes, Physical CDs, and non-iTunes digital charted at #1 on the Christian Gospel charts: Tye Tribbett’s single, "If He Did It Before (Same God)"; Tasha Cobbs’ album, Grace Break Every Chain; and CeCe Winans’ ICON album. 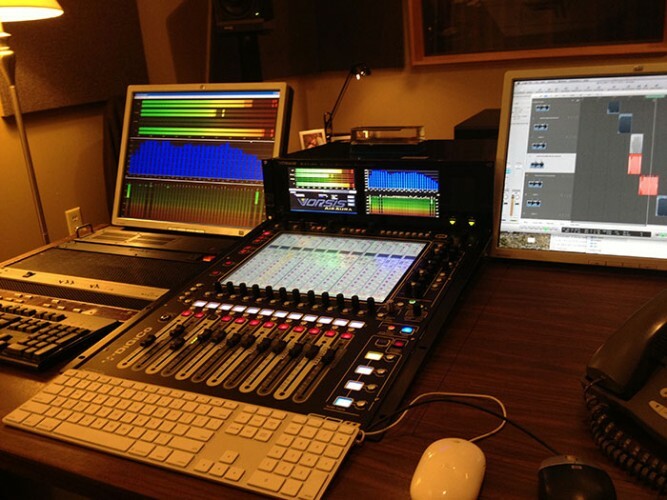 "The concept of mastering is expanding into the film world of using ‘stems’ for surround and I found that the DiGiCo SD11 served as a fantastic mastering centerpiece," he explains. "It's well suited to mastering for its center section layout. With the same engine as DiGiCo’s larger-format consoles, the SD11 offers built-in multi-band compression, snapshot automation (including effects allow for a more efficient automation vs. the linear method that DAWs use), plus having the ability to allow any of its many channels to become true stereo channels, surround channels, or custom-built multi-channels, is unparalleled." Mastering has become an important step for Alibrandi in the process of readying CCMG’s songs for broadcast consideration. "We value the sonic difference between our mixes and our masters. Sometimes a song ‘comes to life’ in the mastering and even though the music may be used just as a ‘bed’ track underneath dialogue, we still want the artistic statement that our artists signed off on, preserved The team that I work with has the opportunity to coordinate mastering instrumental tracks, and at times, mastering in-house along with co Post Production Engineer Bryan Raitt. I believe it helps the film or TV show have a more meaningful impact when the underlying vibe is as wonderful as the dialogue and the sound effects. The SD11 allows us the freedom to let the music dictate what to do with the gear; not the other way around." At Capitol CMG, the in-house Post Production group also works directly with its artists on acoustic videos for YouTube/Vevo. "In the fall of 2012, I multi-tracked, mixed, and mastered acoustic music videos for our label group artists. Acoustic videos can be challenging because of ambient mic bleed. I have learned a lot about Izotope RX, an amazing application that lets you erase sounds that are usually thought to be permanent, such as random noises from the set even continuous underlay sounds such as air conditioning noise. It's also a life saver for any post work where the source was captured in the field. The SD11 is an amazing counterpart to any DAW especially via MADI allowing 56 channels of audio to flow to and from the console (with word/house sync) and its layer and banks allow the engineer to quickly move from channel 1 to channel 32 without scrolling." Alibrandi’s independent mastering company, Mastering.me, has also handled audio post on the SD11 for a few independent films namely, Alex Dreaming and Who Love Judas by Dane Dakota. "With so many new amateur film makers out there with newly purchased HD cameras, there also exists a huge potential for post audio work. The obstacle most of these ventures run into is in capturing audio that's as stunning as the video. Great field recording is a paradox. With so many ‘clean up’ tools available some amateur filmmakers either try to ‘fix it in the mix’ or say, ‘I meant it to sound edgy or raw.’ I have found that once you get a client hooked on quality, there's no going back. Just having the single function of total recall on a center section style console like the SD11 on your desk is more than helpful. When working with indie films—or indie anything—having the ability to save and recall the entire state of your studio with date codes is, again, a time saver and a project saver." "Around the office at Capitol CMG," sums Alibrandi, "I am know as an ‘outside of the box’ thinker. I just really like to make the music sound open and alive. Mastering outside of the box with the SD11—besides giving me a second chance with my ‘upper transient bit resolution’—is just more fun!"